Ravi Shankar Prasad also claimed that the notes ban had resulted in fewer incidents of stone-pelting in Kashmir, put a check on Naxal activities, increased the provident fund (PF) and insurance cover of employees and had given digital transactions a huge push. New Delhi: Critics and political rivals had a field day today at the expense of Union Minister Ravi Shankar Prasad, who asserted yesterday that prostitution has "nosedived," as he listed what has been achieved by banning high value notes exactly a year ago. Mr Prasad was speaking in Bhopal and, like other senior members of Prime Minister Narendra Modi's cabinet, was defending last year's notes ban, attacked by opposition as a "reckless' and "anti-poor" move. "Flesh trade has nosedived in India. Trafficking of women and girls has gone down considerably," the law minister said, adding, "Due to the flesh trade, a huge amount of cash used to flow to Nepal and Bangladesh...Notes of Rs 500 and Rs 1,000 (now junked) were used to make payments in the flesh trade, which has now come down." He also claimed that the notes ban had resulted in fewer incidents of stone-pelting in Kashmir, put a check on Naxal activities, increased the provident fund (PF) and insurance cover of employees and had given digital transactions a huge push. "I have the data," the minister said. However, the data he was asked to furnish by many on social media was to support his claim on prostitution. "If this is indeed true and @rsprasad actually said it, could the Hon'ble Law Minister please enlighten us which government department tracks prostitutes & keeps a tab on their earnings. The nation wants to know," tweeted the Congress' Manish Tewari, a former union minister today, appending his tweet with several emoticons. Commentator Suhel Seth called it "shocking," also tweeting, "I am just amazed and horrified that @rsprasad's measure of Demonetisation's success is a decline in prostitution? Do these folks even know what they say and what they tweet? @narendramodi these comments don't serve the Government well." A year ago today, the Prime Minister had suddenly banned high value notes yanking 86 per cent of the currency in circulation at the time, in an effort to combat corruption and black money. The government is celebrating the first anniversary of the notes ban as "Anti-black money day" to counter the opposition's protests on what it has labelled a "black day." PM Modi tweeted a seven-minute film early on Wednesday morning that he said encapsulates "the benefits of demonetisation," also stating that "125 crore Indians fought a decisive battle and WON". He launched a survey asking people what they "feel about the efforts to uproot corruption & black money," also tweeting, "I bow to the people of India for steadfastly supporting the several measures taken by the Government to eradicate corruption and black money." The Congress and other opposition parties protested today across the country against the notes ban, with Congress vice president Rahul Gandhi saying, "Demonetisation is a tragedy. We stand with millions of honest Indians, whose lives & livelihoods were destroyed by PM's thoughtless act. " His party's P Chidambaram, a former Finance Minister, challenged the government on its claim that the notes ban helped choke black money and demanded that the government make public Central Bank RBI's agenda, background note and former Reserve Bank Governor Dr Raghuram Rajan's notes on demonetisation. "We don't understand what the Congress' problem is with anti-corruption measures. Why is the Congress so irritated with honesty?" 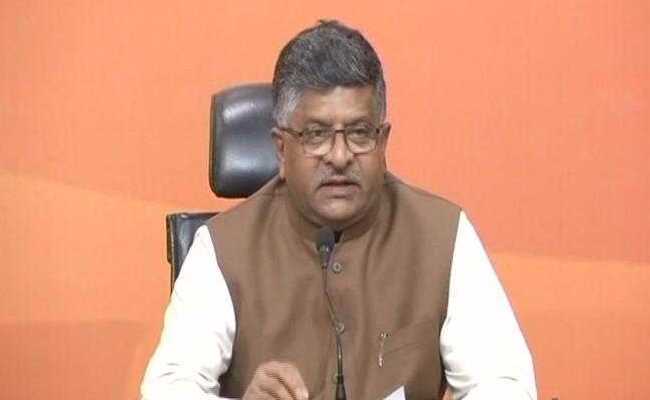 said Ravi Shankar Prasad, alleging that "If Rahul Gandhi was in any other party, he would've been thrown out...wherever he steps in, the Congress loses elections." Mr Prasad accused Mr Gandhi of thinking "only about his family and not about the poor people."